George Inglis is one of Scotland's most prolific singer-songwriters and with his band, Rockin' Horse, has enjoyed several successes in the prestigious Hotdisc Top 40, including three British & Irish Chart No.1s and TV appearances in Ireland and on BBC ALBA. 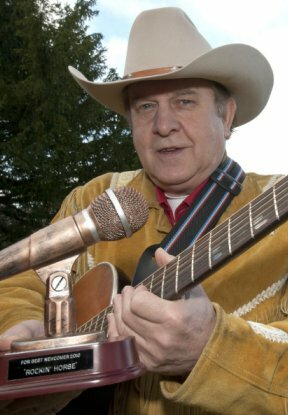 The release of his album, "Barstool Cowboy", has given his music a new lease of life, with several singles from it getting airplay right across the world. One of those singles from the album, "The Man In Black," was very successful, reaching number 1 on the Hotdisc British & Irish Top 10 countdown. It was his own tribute to Johnny Cash, but further success gave him another number 1 with the title track from the album. "Children Of The 60s" was also a chart topper. Based in the Scottish Borders George is very much in demand for live gigs all over the UK and he has currently released an e.p. and the album, "Anthology" which features some of the best tracks from his recording career to date, including Hotdisc Number 1 singles "Missing You" and "I Am The Train." You can listen to samples of his songs on the Music page and buy direct from iTunes, Amazon or order the CD album from here.